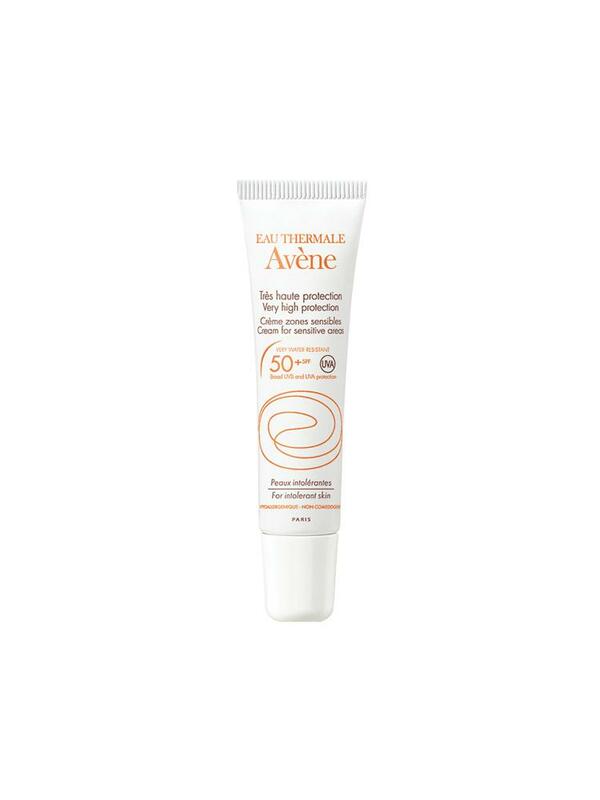 Avène Sun Care Cream for Sensitive Areas SPF50+ 15ml is for intolerant, irritated skins or skins having undergone a surgery and is adapted to localized sensitive skins such as the fragile face skin (nose, cheekbones) and recent scars. - Avène Thermal Water provides anti-irritant and soothing properties. Rich and creamy, this slightly tinted cream is water resistant. It protects fragilized localized areas. Without chemical filter, fragrance, paraben. Hypoallergenic. Apply a thick layer on the skin before sun exposure. Indication: Very high sun protection SPF50+. Intolerant skins. Avène Aqua, Titanium Dioxide, Isodecyl Neopentanoate, Trriethylhexanoin, C12-15 Alkyl Benzoate, Cyclomethicone, Glycerin, Polyglyceryl-4 Isostearate C30-45 Alkyl Methicone, Cetyl Peg/PPG-10/1 Dimethicone, Hexyl Laurate, Aluminia, Aqua, Stearic Acid, Hydrogenated Castor Oil, Caprylic/Capric Triglyceride, Caprylyl Glycol, Disodium Edta, CI 77492, CI 77491, Octyldodecanol, Silica, Dimethyl Silylate, Sodium Chloride, Sodium Myristoyl Gluatamae, Sorbic Acid, Tocopheryl Glucoside, Triethoxycaprylsilane, Xanthan Gum, Tetrabutylpentaerithrityl Hydroxydrocinnamate. Very good if you have sensitive skin and cannot use chemical suncreens. This mineral sunscreen is more moisturising and less white than the other mineral sunscreen in the larger tube by Avene. It is a tiny tube but the product spreads well. Will use this for scars following surgery. Good that it is slightly tinted so it will blend in with surrounding skin.